Pythagorean enforcers…they’re not just crazy, they’re irrational. Some folks say all murder is irrational, and there may be some truth to this, as 5th Century Pythagorean cultist Hippasus of Metapontum, the man credited with the discovery of irrationality, mathematically speaking, is rumored to have been murdered for the crime of divulging the existence of irrational numbers. 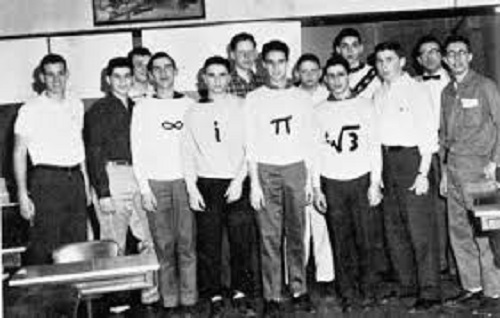 Maybe like the rest of us, you fell asleep in math class that day, but irrational numbers are, well, a bit weird. You see, the universe is built on what they call “natural numbers”. Natural numbers are super useful for stuff like counting and ordering things, additionally interesting because they can be used to generate the subset of “real numbers”, that is, a value you can place on a continuous and infinitely long number line, like “3” or “Pi”. The real numbers include all the “rational numbers”, or any number that can be expressed as the quotient of two integers (and that doesn’t result in a decimal portion that is non-repeating into infinity i.e. ½ or 5.66666….Then you have the other subset of the real numbers called the “irrational numbers”. Irrational numbers can’t be represented as a simple fraction since they neither terminate nor repeat, such as the ratio of a circle’s circumference to its diameter, Euler’s Number, the Golden Ratio, or √2. This is widely regarded as awfully inconsiderate of them, which is why we have largely ignored them for most of human history. Mathematicians in 7th Century B.C. India may have been toying with the idea that irrational numbers existed, but the Indian early medieval age was largely characterized by regional warlords clobbering each other over the head, so employment of Indian mathematicians outside of the defense contracting industry was relatively limited. On the other hand, Ancient Greece concurrently came up with the notions of philosophy, disposable income, and the sabbatical, freeing up the average Greek mathematician to turn his attention to imponderables and proofs of existence. Not that they did. They wanted to build cool stuff like the Acropolis. Before Plato and Aristotle became philosophical superstars, 6th Century B.C. philosopher, mathematician, and mystic Pythagoras of Samos was diligently figuring out that mathematics were the key to the universe. We don’t know that much about Pythagoras himself, and most of what we do know was written down by his followers or biographers several hundred years after he died. He could have been a loon, but one thing’s for sure – dude knew his hypotenuse. Pythagoras thought numbers were so awesome that he founded a religious sect based on the notion that numbers constitute the true nature of things, and propounded an entire cosmology that centered on ideas of numerical harmony. Not too shabby for the guy who’s theorem you had to prove a few hundred times in high school geometry. The bottom line is that subsequent generations of Pythagoreans took their numbers seriously. Pythagoras was also busy preaching vegetarianism and temperance, which were wildly unpopular with Greeks at the time, and eventually Pythagoras and his followers were persecuted, killed, or driven out of Greece. Pythagoras wound up starving himself to death in Metapontum, Italy, but his followers carried on his traditions for a few more centuries. About a hundred years later, the Pythagoreans were busy maintaining the traditions, and attracted the attention of a young gentleman named Hippasus. Now, up until this time, Pythagoreans were busy telling the initiated that all numbers could be expressed as the ratio of integers. It made for a nice, orderly, comprehensible universe. Along comes Hippasus, party animal that he was, and in trying to inscribe a regular dodecahedron inside a sphere, happened across the existence of irrational numbers. The discovery of irrationality was so staggering, that no doubt Hippasus felt he had to tell somebody. Which he did. And this got him killed. Little did we know that mathematics, like the Sicilian Mafia has its own omertà (“code of silence”), the violation of which seems to literally result in one’s “sleeping with the fishes”. As is usually the case with mathematical mafia hits, no corpse was ever found, hence rumors abounded about why and how Hippasus was bumped off, much like Jimmy Hoffa. 3rd Century A.D. Syrian Neoplatonist philosopher Iamblichus noted the confusion over the exact circumstances under which Hippasus was silenced. “Hippasus, one of the Pythagoreans, is said to have divulged the theory of commensurable and incommensurable quantities to those unworthy to receive them, or for having revealed the method of inscribing in a sphere the dodecahedron, one of the five solid figures, and claiming the credit for this discovery for himself so that the other disciples not only expelled him from their common association, but built a tomb as for one who had passed from the human into another life, or another account is that the Divine Powers were so indignant that he perished in the sea” (Iamblichus, 1905, p31-32). Of course, the perpetrators were all too happy to credit the grisly end of Hippasus as shark bait to Poseidon, since the pantheon of gods was largely outside the legal jurisdiction of the authorities, thereby stonewalling any serious investigation. Some say that the story of Hippasus’ drowning was just a cover-up to throw the cops off the trail, and that he was quietly murdered elsewhere. Now what was all the fuss about? The Pythagorean religion was founded on the notion that numbers were everything, the alpha and omega of perfection and order. Throw in some irrational numbers that make it technically impossible to precisely solve a beautiful little equation like a2+b2=c2 to find the length of the hypotenuse (a triangle with two sides 1 unit long each, result in an irrational hypotenuse of √2) and obviously it’s a short distance to fire and brimstone falling from the sky, rivers and seas boiling, earthquakes, volcanos, the dead rising from the grave, human sacrifice, and cats and dogs living together. Hippasus had to go, and the Pythagoreans engineered a plausible “accident” to ensure they could keep the existence of irrational numbers under wraps for at least a little while longer. Perhaps you are considering a lucrative career in mathematics, and far be it from me to discourage you as the world could do with a few more mathematicians, but be aware of the practical dangers, the politics, the conspiracies, and the inquisitions. You put your life on the line with every proof. They might name a theorem after you and you will be remembered by future generations, but take note that Pythagoras himself sagely observed, “Reason is immortal, all else mortal”. Kind of sounds like a threat, doesn’t it? Heath, Thomas Little, Sir, 1861-1940. A History of Greek Mathematics. Oxford: Clarendon Press, 1921. Iamblichus, ca. 250-ca. 330. The Life of Pythagoras. Abridged. Los Angeles: Theosophical Publishing House, 1905. The progress of mathematics has been slow and painful over the centuries. Irrational numbers were identified as such because they were not expressible as the quotient of two integers. But then came along the “transcendental numbers” which are not expressible as the result of algebraic operations to add to the pain. These are numbers such as pi, e, the trigonometric functions, and natural logarithms. I am looking forward to the discovery of even more abstruse numbers which can’t be expressed in terms of known transcendental numbers so mathematicians can get over themselves.